Injury and accidents – One of the most common injuries is whiplash, which occurs in an accident. In this, the head moves backward and forward rapidly, affecting the ligaments and the muscles in the neck. This further results in pain and stiffness as the muscles respond by contracting and tightening of the muscles. Muscle strain or sprain – Certain activities put pressure on the neck muscle. It majorly includes poor posture, sleeping in a wrong position, sudden jerk while exercising, and even not changing position often while working at a desk. Diseases – Not many people know, but certain conditions like rheumatoid arthritis, cancer or even meningitis also cause of neck pain. Age – As other joints in the body tend to wear out, so do the neck joints. As you age, the muscles in the neck wear out. It is called as osteoarthritis or spondylosis, a widespread occurrence. Mild neck pain can be treated within a few days by taking painkillers. However, in the case of unbearable neck pain, seeking immediate medical help is highly recommended. Severe neck pain can be unbearable and makes it difficult to move the neck from side to side or up and down. This can have a significant impact on your day-to-day activities and clearly states you need medical attention. Self-care suffices for mild to moderate neck pain. However, if the pain persists, getting in touch with a doctor for treatment is essential. To relieve the pain, the doctor will prescribe certain medications. Depending on the severity of the pain, physical therapy may also be prescribed. Certain tests such as X-ray, CT scan, MRI scans and so on are conducted to determine the primary cause of the neck pain. 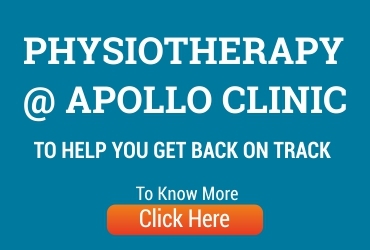 At Apollo Clinic, we leave no stone unturned to make sure that every patient gets the best treatment, irrespective of how major or minor the problem is. A thorough diagnosis of the condition is followed by medications and surgery in case of extreme circumstances.